DID YOU KNOW — Seoul’s mobile plastic surgery advertisements have seats inside them, and you can use them to ride from place to place? Mobile plastic surgery advertisements are a constant presence on the roads of Seoul. They’re a great way to stay informed about the latest eyelid trends, compare surgery techniques, and keep a lid on square-jawed girls’ self-esteem. But did you know they also perform a socially beneficial function that even the already-beautiful can use? That’s right! You can use them as a form of public transportation. 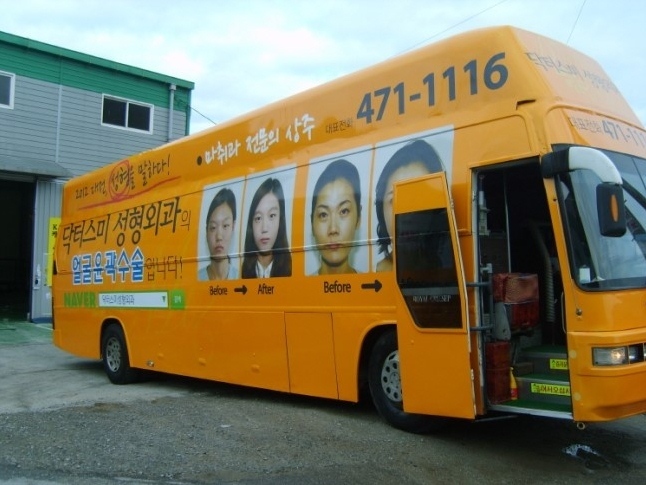 In Korean, a mobile plastic surgery ad is called a BUS. You can ride a BUS by finding a BUS STOP by one of Seoul’s many brothel advertisement card receptacles (ROADS). Seoul’s BUSES are driven by physically perfect, kind-hearted DRIVERS who have already benefited from Korea’s best plastic surgery techniques and want to help others. Try riding a BUS today. This entry was posted on January 31, 2012 at 5:17 am and is filed under Korea. You can follow any responses to this entry through the RSS 2.0 feed. You can leave a response, or trackback from your own site. Unlike many other expats, Korean culture is only a mild itching powder on Billy Robertson. I’m glad the particles have enough accumulated to force him into writing more of these. Can it be? Is Billy B back? Please let this be the first post in the long awaited return of the best Korea writer on the net. Fereals. Let me tell you another thing about these buses, and websites that write about them. They took me for a ride. All the way to Thwarted Expectations – ville. what a taste! more to come? So happy to see you’re back in business. We missed you. God how I missed you……did that just make me sound gay? This is what you called hitting two birds with one stone. Two in one. Be buy cheap viagra online enclosed in the health and pl_eas u_re.